Is this new? Yes, the Governmental Accounting Standards Board issued guidance covering accounting and financial reporting for intangible assets. This guidance was effective July 1, 2009. The University’s Board of Trustees adopted Policy 3‐043 Accountability for Intangible Assets on February 9, 2010. 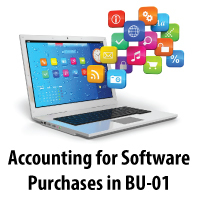 While the policy covers several different kinds of intangible assets, the type most frequently encountered by departments will involve the purchase or development of software. The entire policy can be found here. What kinds of software are capitalized under this policy? May be fully developed by the University or may be purchased, but require more than minimal incremental resources to implement. “More than minimal incremental resources” suggests a project involving significant staff time; an extended implementation period; and/or the use of outside consulting assistance to implement. If the project is for research purposes, it is not subject to this policy and is not capitalized. In general, software purchased on Fund 5000 Projects would not be within the scope of this policy. Projects must have an estimated budget of at least $1,000,000 and an expected useful life in excess of ten years. “Useful life” refers to the period the software is expected to be utilized before it becomes obsolete. A useful life generally begins after the development or implementation are complete. What about upgrades? Upgrades and enhancements are capitalized only if there is a significant increase in functionality. Routine upgrades are not capitalized. What about annual maintenance costs? Annual maintenance costs are not capitalized. My department is planning a software purchase soon and it will be over $100,000. What should we do? A new Account was created, 61500 Software Purchase >$100,000. Please use that Account when purchasing software that should be capitalized under this policy. Please keep in mind that annual maintenance payments or user licenses, even if over $100,000, should not be capitalized. What if I have questions? Departments in Business Unit 01 should contact General Accounting.